Three times each school year, MPS Culinary & Wellness Services hosts True Food Taste Tests during lunch in elementary and middle school cafeterias to expose students to new flavors and food, and encourage adventurous eating habits. 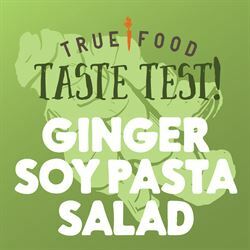 On May 8-10, 2019, students and staff at participating elementary and middle schools will have the opportunity to try our new... GINGER SOY PASTA SALAD! This spring-inspired recipe features pasta and an assortment of fresh vegetables tossed in a smooth dressing made with ginger, soy sauce, sun butter, and spices! Poster You might see these hanging up at taste test schools! --coming soon! Outreach Language Copy and paste a sample newsletter blurb, PA announcement, and more! --coming soon! Everything You Need to Know A cheat-sheet for schools and volunteers about the taste test --coming soon! Math/Science Worksheet Themed lessons tied to the taste test item --coming soon! English/Social Studies Worksheet Themed lessons tied to the taste test item --coming soon! Mindful Tasting Activity How to practice mindfulness while taste testing --coming soon! “I love that it introduces real foods to the kids-it's a fun way to engage with the kids about healthy eating and creative thinking." "I appreciate the opportunity for kids to try things they may not have a chance to at home. One of the students tried it, and told me he was thinking of going to a culinary school to be a chef, so he wants to try all different foods." "It was a fun, simple way to introduce new flavors to the kids, and it was very low-stakes, so the kids felt comfortable accepting or declining the new food item." With support from The Wedge and Linden Hills Co-op, MPS Culinary & Wellness Services began our True Food Taste Tests in 2013. Since then, we've taste tested a variety of recipes featuring local ingredients, Farm to School produce, and unique textures and flavors! Curious what recipes we've taste tested in the past? Check out the recipes HERE. Schools are still in the process of signing up for their taste test dates, so please check back again soon to learn what day each school will be taste testing on! Interested in bringing the taste test to your school? Email Kate.Seybold@mpls.k12.mn.us. Thank you to all our volunteers and sponsor, Wedge Community Co-op, for another great year of taste tests!